Remote access by consultants for the management of your workstations and servers can be a threat to your organization's security and erode your efforts to maintain regulatory compliance. Netop Remote Control gives you complete, centralized and granular control over access rights as well as keeping a complete audit trail that enables you to monitor and report on all vendor activity for billing and auditing purpose. No other company has more experience securing remote connections for businesses. Data transmitted between Windows, Linux and Mac OS X modules can be encrypted using the Advanced Encryption Standard (AES) with key lengths up to 256-bits. Integrate Netop with your existing security scheme and authenticate users with Windows authentications, Directory Services via LDAP, RSA SecurID and local or remote login with Smart Cards. Netop allows you to assign flexible security roles, define access and grant remote support privileges. Regulatory compliance and the high costs of security breaches has become a challenge for businesses. Many organizations, such as those in the health-care and financial sectors, are subject to so many different types of regulation, that selection of remote access tools with both the flexibility and security to fully meet requirements has become crucially important. Netop is the most secure and flexible solution available. The technical staff can't be everywhere at once so there's a good chance that they are using remote tools to manage their heavy workload. Consolidating into a centralized, secure solution not only saves your company money and training resources, it allows your staff to provide superior service to all of the computers and devices you rely on from one console. In addition, using Netop Remote Control lowers your risk by keeping security practices intact throughout your organization and giving you the ability to immediately track down the source of problems. Risks to your company come from all directions. Security audits can cost your company money. Employee actions on your network either by accident or in breach of your policies can put your information and your customer data at a grave risk. 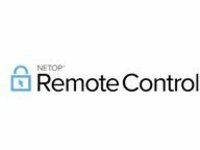 Netop Remote Control gives you the ability to log network activity both locally and on shared drives and servers. And when it comes to compliance you need to be able to show what happened, when, and by whom. Is your company at risk for costly security breach? While the potential fallout for larger enterprise is huge, even small and medium-size companies may have significant trouble weathering a data breach. Think about your company's cash flow and whether it could cover the investigation and containment of the breach costs for the incident in addition to the fines, remediation expenses, attorney and legal fees. Netop Remote Control can help you meet security compliance standards and protect sensitive data.